Soap Plant or Chlorogalum pomeridianum - This beautiful plant sleeps in. I discovered this the hard way. First time I saw these plants was in the evening. I came back the next morning to take some more pictures and they were all rolled up. One thing you will notice is that when there are flowers the leaves of this plant will be dried up around the base like a bunch of pieces of rope. The star-like flowers you do see have an exceedingly short life - in the late afternoon one row of buds opens, starting from the bottom. 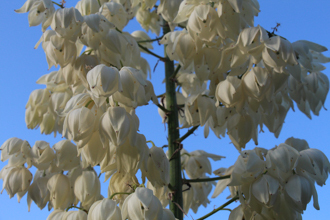 The delicate white flowers twist closed by evening and never open again. Each day in the row above the last flower, a bud opens and blooms before pulling itself closed forever. If you look carefully at the photos on this page you will see the twisted bloom of the previous days, and unopened new buds up the stem from the most recent flower - there can be up to 200 buds per plant. Botanists classify this plant as a Panicle or Branched Raceme. In laymans terms a Raceme has flowers connect to a stem (pedicel) before connecting to a stalk (Peduncle). The Branched designation means that the plant has multiple Racemes. Soap Plant refers to the fluids in the plant bulb that contain saponins. These form a lather when mixed with water. Native and early Americans used the bulb as food, soap, sealant and glue. The cooked leaves and bulbs were eaten. Bulb fibers were used to stuff mattresses by settlers and for brushes by native Americans. Crushed bulbs were used in water to stun and catch fish - the saponins are toxic to fish and probably other critters. When the bulbs were baked the fluids congealed to form a glue that was used to attach feathers to arrows and sealing baskets. This plant benefits from fire because it can regenerate by seed or deeply buried bulb. Fire seems to stimulate the seeds in the ground. Plants generated from seed can take 5 to 10 years to reach maturity. A variety of bees honeybees, carpenter bees, bumblebes) are the primary pollinators. The Pollinators have a limited time (afternoon to early evening) with each flower but the Soap Plant counters with a new flower everyday until it runs out. Last modified: March 31 2017 21:25:45.